Blackheads are flat unlike pimples. Blackheads are not infections like pimples. Blackheads only occur in hair follicles with wide openings. Blackheads are clogged follicles which are clogged with sebum and dead skin cells. Chemical reaction takes place when these clogged contents oxides the melanin in the skin cells. This will give a distinctive dark color to that area and these clogged follicles get the appearance of small black dots and is known as blackheads. 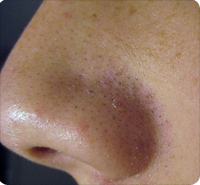 Blackheads are usually seen in oily areas of the skin, particularly on and around the nose. The pore of the skin remains open in the case of blackhead which makes it to change the color when exposed to air. To fight against blackheads, drink plenty of water and eat a healthy diet. Oil intake is not the cause of blackheads but it is better to reduce oily and fat food. People with blackhead have a sensitive skin so they should us gentle skin care products. Black head is difficult to remove when it is developed in the warmest parts of the body. Blackheads also occur due to blotchiness of the skin which is the result of over exposure to sunlight. Blackhead can be seen in people of any age group. It is not necessary to remove blackheads as it is often removed by the body itself. You can remove it also by using exfoliants, topical retinoids, salicylic acid, blackhead strip or can be extracted with the help of comedone extractor. Pimples are infections which may occur anywhere on the skin and spread in to the surrounding tissues once it bursts. Pimples cause redness and swelling to the skin. Pimples are concentrated where there is a high concentration of oil glands. Higher concentrations of oil glands are found on face, back and chest. Pimples are swellings which results from oil, bacteria and dead skin cells trapped in hair follicle. Pimples eventually burst and spread to the surrounding tissue. The oil secreted from the glands carries dead cells to the surface of the skin and the hair follicle get clogged resulting in a pimple. The oil secretion creates a perfect environment for the bacteria to grow. The bacterium is Propionibacterium which is normally harmless but in a suitable environment, it will cause inflammation of the skin and redness to the skin. Under the surface of skin, cysts can develop in some severe cases which will spread infection to the surrounding tissues. Many teenagers are suffering from pimples because of the hormonal changes. Regular cleansing of your skin will reduce clogged pores and makes it easier for the skin to breathe. lancedeepa. "Difference Between Blackhead and a Pimple." DifferenceBetween.net. October 9, 2009 < http://www.differencebetween.net/science/health/difference-between-blackhead-and-a-pimple/ >.